Captain America has some lessons he wants to share with the children of the Marvel Cinematic Universe, and now you can follow along at home with new footage of Spider-Man: Homecoming's Captain-centric public service announcement series "Rappin' with Cap". The clips, which cover everything from gym safety to nutrition, are exactly the sorts of things you've glazed your eyes over as a child during one-sided school presentations and the like. They originally appeared as a set of gags in the latest Spider-Man movie, filmed in more innocent times before the Captain became, in the words of Homecoming's gym teacher, some kind of war criminal or something. The new scenes were posted on Twitter by the user MCU_Tweets, with a two-minute video made up of smaller educational segments from Cap at his very cheesiest. In the clips, he gives advice about eating a good lunch, or how to put the flames out if you happen to catch fire—the sort of knowledge anyone can use, from ages nine to 99. 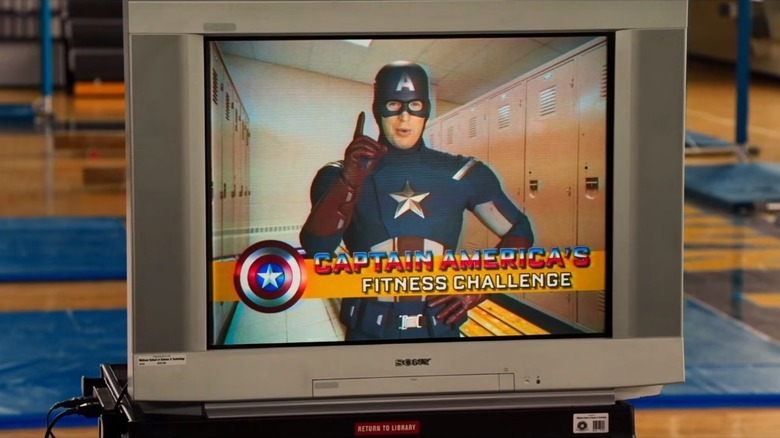 It's not clear if these were originally supposed to be in the movie or not—it's evident the production shot a bunch of Captain America PSAs, for the in-movie gym gag and post-credits scene. And while combined they're a little much, they hearken back to all the qualities about the Captain that we like the most—his earnest civil service, among other things. Who cares if he's just talking about sandwiches—look at that smile! Whether you're a student, a soldier, or "not really a comics guy but I do quite like the movies," Captain America has a tidbit of advice for you. Check out the hilariously earnest and on-point public service announcements below.